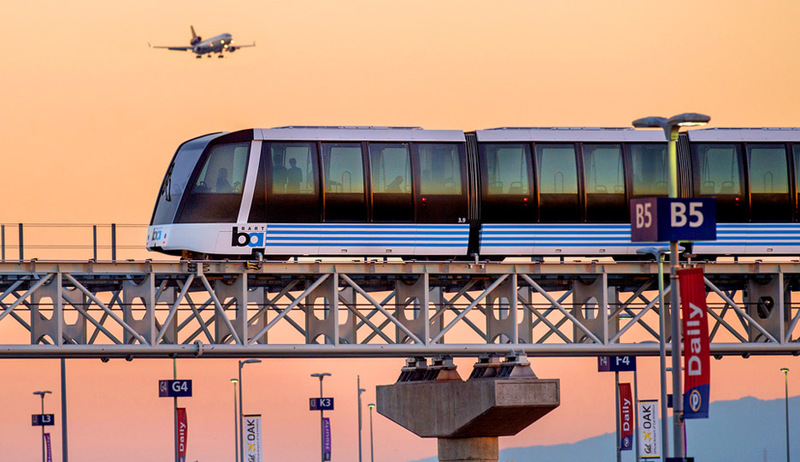 The Oakland Airport Connector is a 3.2-mile BART extension between the Oakland Coliseum Station and Oakland International Airport. An Automated Guideway Transit (AGT) system runs primarily on an elevated guideway in the median of Hegenberger Road, the heavily-traveled main route to the terminal. Air traffic control concerns required one cut-andcover tunnel at the intersection of Doolittle Drive and Airport Access Road. The route continues on an elevated guideway to its destination at the airport terminal. As part of the design-build team, CHS Consulting Group provided traffic engineering services including traffic signal design and plans, signing and striping plans, traffic operations and engineering analysis, and maintenance-of-traffic plans. For this fast-track project, CHS modified traffic signal designs along the entire project corridor. In addition, there were numerous non-signalized intersections along the route that require maintenance of traffic plans. The project also requires complete reconstruction of the Doolittle/ Hegenberger intersection. Much coordination was required among the design-build team, BART, Caltrans, Alameda County, the City of Oakland, and the Port of Oakland. CHS was fully staffed at the BART OAC Project Office, and completed our contributions on schedule. The project has been completed and opened to the public in November, 2014.